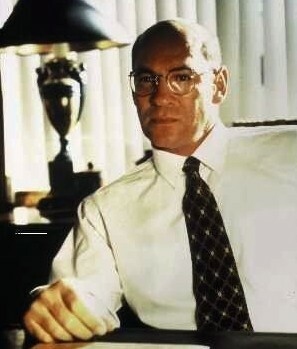 Ex-Marine, Assistant Director Walter Skinner originally had very little patience with Fox Mulder's unorthodox methods of investigation as well as his submerssion in the X-Files project, when Agents Mulder and Scully were assigned to him toward the end of their first year as partners. He warned the agents that their inquiries into the paranormal were crossing into dangerous territory, and at one point, shut down the X-Files entirely. His direct approach in telling the agents exactly what they could and could not do within the X-Files division, was what had made him out as one of Cancerman�s minions and essentially against all Mulder and Scully's efforts to divulge the truth. As time went on, however, Skinner proved to have a mind of his own and began to assist Mulder and Scully, by reopening the X-Files and help the agents keep them open. Though he has proven to be a valid ally for them, it was never clear whose side Skinner is on, or whose orders he takes, but his efforts on behalf of Mulder and Scully "through unofficial channels" have made it plain that he is deeply concerned about his independent-minded agents and their work. Throughout all of their trials and tribulations, AD Skinner has "been there" for Agents Mulder and Scully and going to vast lengths to simply keep both agents alive and employed. Skinner has come full-circle as a person and continued to make ventures into the X-Files in order to discover the truth.